My family has become accustomed to knowing that their Mama is not a Michelin star chef, nor am I June Cleaver or Martha Stewart. I have a tendency to do the same meals over and over, and honestly when I say “do,” it really means my hubby does it because I requested it! I love meals that are quick and easy, doing the job of nourishing bellies and souls. Unless I am in the kitchen cooking with my hubby or kids, I’d prefer not to be in there. However, as my mindset of wellness and clean eating continues to change and I learn more and more, I realize the importance of making our eating and health a priority but also giving ourselves grace in knowing that we will never be perfect and sometimes we need to warm something up in the microwave! We had my parents over for dinner the other night, and the menu was homemade enchiladas, black beans and rice, so I thought having burritos as an appetizer would hold them off until the real meal was complete. You see, we are a bit more flexible with meal times at our house, while we typically have a meal plan, we don’t really have a “meal time” and it varies by day. My parents on the other hand are a little more scheduled, because while we can eat at 7:30 pm (kids are late risers), they’re ready to go by 5:00pm! In typical fashion, I was running around with my daughter and mom perusing estate sales and thrift stores during the day, then more errands in the afternoon and totally forgot to thaw the organic ground turkey for the enchiladas for dinner, so let’s just say we already were having a late start for dinner. I also forgot to delegate the task, so there’s that otherwise someone would have done that for me. Enter the idea for a pre-meal snack, aka appetizer! Thankfully I knew that I was going to be doing a taste test with the family for Alpha Burritos this weekend so I ended up whipping together some fresh salsa and firing up the panini press! These burritos are so easy to make, you warm them in the microwave for about 80 seconds (always check your wattage and read the label) and then use the panini press to add a light grill mark. I like to brush a dab of butter or ghee on the outside so it gives the burritos a nice little crunch. Alpha Burritos are GMO Free and each contain 11grams of protein per burrito. Additionally, they contain anywhere from 300-320 calories. I wasn’t sure how my family would take to the Alpha Burritos since they are plant-based and most of us are not vegan or vegetarian, but I wanted them to try them due to the clean nutrition label and high levels of protein. We are really trying to limit our processed food intake, but sometimes when we are traveling and only have a microwave available for heating food I am always looking for new products that have clean ingredients. Sadly, I had to leave ALL the taste testing to the family since the burritos are not gluten free and contain soy, something that I personally do my best to stay away from. Gluten aside, I think if the burritos were without the soy I would buy them more often for my crew, but with a family history of soy being an issue sometimes to our current health ailments, I honestly don’t see myself purchasing these consistently. For my family members that are Vegan and Vegetarian, these will be nice go-to’s in the freezer when they visit and we need some appetizers, snacks, or side dish! First response from my testers was that they really liked them, my dad loves meat, and is always hesitant about what I try to feed him, but he seemed to enjoy the fresh salsa topping the Chick’n Fajita burrito! My mom had the Philly Sandwich, and she added her own salsa on top (I thought salsa on Philly Cheesesteak was a little interesting, I would have opted for sautéed mushrooms and swiss myself, haha). My hubby ate the Pizza flavor. While they all said they liked the overall texture and flavors, they felt it still wasn’t seasoned enough, and kind of bland. This opinion was amplified when I revealed that it was 100% plant-based and had no real meat in the burrito. Perhaps it was in their heads, because they couldn’t tell at first. I found that interesting, but again, could not taste it myself so I have to share their opinions with all of you! I think if there were more garnishments and varied toppings for them it would have added more flavor. But these would do the trick for a quick bite at the hotel while we travel! Based in Glendale, CA, Alpha Foods is committed to animal welfare, a healthy planet and healthy humans. They offer burritos and hand pies as plant-based convenience foods. There are four burrito flavors, Mexicali, Philly Sandwich, Chick’n Fajita and Pizza! I was able to find three of the four flavors, unfortunately my local Walmart was out of Mexicali - but I bet that would have been a hit! Being in Northern CA, I found Alpha products at Walmart, Sprouts Farmers Market, and Safeway. You can find a store near you » here. Another fun thing I love about Alpha Foods is that they have a recipes tab, showcasing some great pairings of food and drinks for their burritos and hand pies! OH, yes, hand pies. I sure hope they add in some gluten and soy free options to their product line up, soon! How do you satisfy the initial hunger of your family when you’re running late? Want to jazz up your party food? These would make great appetizers, just add guacamole, salsa sour cream, and/or marinara (for Pizza) on the side! Disclaimer: As a blogger for Moms Meet, I was sent a panini press, veggie chopper and complimentary vouchers to try Alpha Burritos and share my honest opinions. Compensation for this post was provided and this page may contain affiliate links. Did you get a chance to visit Disney’s California Adventure Park is the Food and Wine Festival? I wanted to share my recent experience as an Annual Passport (AP) holder. Throughout the year Disneyland Resort has special events and often have exclusive experiences for AP holders. The AP Disney California Adventure Food and Wine Festival Sip and Savor pass was a great purchase & experience, so I look forward to more AP events in the future! It was a great way to really get the most out of The Disney California Adventure Food and Wine Festival experience. The AP Food and Wine festival Sip and Savor Pass was $45, including tax, and consisted of 8 coupons. With over ten festival marketplaces there was definitely something for everyone. Like many AP events, alcoholic beverages are a separate fee. Even then, I knew that I had to try the Mimosa Flight, located at The Uncork California Marketplace. The Mimosa Flight included a Pear Mimosa, Apricot Mimosa, and Mango Mimosa. My favorite? The pear! Pass holders also received a special AP button at each marketplace location, with a Sip and Savor Pass redemption. The AP corner included a special photo opportunity, a Festival handout, a free Food and Wine Festival button (the design changed weekly) and of course you can't forget limited time merchandise! Did you attend Disney California Adventure Food & Wine Festival, too? We would love to know what your favorite bites were from the Food and Wine Festival! Please share your thoughts with us! Disney + Food and Wine? It doesn't take much to get me excited about visiting Disneyland Resort (DLR), but the notion of amazing eats and adult drinks has me absolutely elated. I didn't have the chance to visit DLR for last year's event, and sadly this year I will not be eating and drinking my way around Disneyland California Adventure Park (DCA), but my bestie, Sarah will be so stay tuned because she will be reporting on her fun soon! Are you a food and/or wine enthusiast with a love for magic? You will want to mark your calendar for this year's Disney California Adventure Food & Wine Festival, now through April 16, 2017. There are just two weeks left of this event, so make it a date night (or day) and head to DCA! There are so many activities for all ages, so feel free to bring the kiddos! Bonus, if you're an Annual Passport holder, make sure to check out AP Corner for limited edition experiences and treats. There are over a dozen marketplaces open daily that will offer complementing cuisine to the Festival-inspired menus throughout the theme park's restaurants and eateries. We have picky eaters & food allergies in our house, so knowing the amount of options available to all of my kids (and me) is important. So many amazing celebrity chefs have been scheduled to appear since opening on March 10th! Here's the lineup for the last two weekends. Visit Disneyland.com/foodandwine to purchase your tickets! You know Disney does it big, so they have an amazing schedule of activities and opportunities for pretty much everyone in your group. Sweet Sundays sound like an amazing way to spend a lazy Sunday - learning how to make sweet treats, and then eating them! This is a 90-minute culinary demonstration that includes a light breakfast and sparkling toast! Winemaster & Brewmaster Dinners (Thursdays) offer a four-course meal, paired with either wine or beer. Courses are created by the Disney Executive Chef Team and you'll have an opportunity to hear from the winemakers and brewmasters about the pairings! *Signature Events require separate ticketed admission to enter Disney California Adventure Park. Who wouldn't want to cook with Chef Goofy?! I seriously wish this was around when I was young! Kids ages 3 to 11 are invited to get their cooking groove on with Chef Goofy and the Jammin' Chefs, and you can't forget sous chefs, Chip 'n Dale. Get hands on cooking experience and go home with a yummy treat! This musical program will happen daily in Paradise Park, near Golden Zephyr. Space is limited and is on a first-come, first-seated basis. Don't miss out on a chance to hang with some of Disney's celebrities! Alright, magic makers, if you've got the time and the budget agrees, clear your calendar for a day to enjoy the Disney Food & Wine Festival, it would be a wonderful time spent, especially if your family is getting ready to relax for spring break! Feeling extra spontaneous? Make it a weekend and book a trip with my travel partner - Get Away Today. Use my code "SPARKS" to get $10 off a 2 night package. So, what do you say? Will you be making your way to experience Disney California Adventure Food & Wine Festival? Finish off September with FREE Pancakes for the Kids & a Great Cause! The season of fall has arrived! I'm always excited for cooler weather and warm drinks like hot chocolate, especially with a nice fluffy stack of pancakes. My sister swears by Denny's amazing hot chocolate so I am going to be trying it myself soon. I consider myself a hot cocoa connoisseur, so we will see about that. :) I'm always up for a challenge! Kids are back in school, holidays are coming soon (yes, I know it's only September, but I can't help it). And every year, Denny's teams up with non-profit organization, No Kid Hungry, a company that partners with local schools and communities in helping to end child hunger in America. To date, Denny's has donated $3.3 million to the organization, assisting children throughout America. This year was the sixth year of participation on behalf of the restaurant and its team. With the launch of the new fluffier pancakes this summer, and for the month of September, Denny's offers free pancakes to its littlest fans every day from 4 pm - 10 pm, with the purchase of an adult entree. This gives kids (who happen to be the toughest critics) the opportunity to see how Denny's new recipe stacks up. Along with the promotion, For every $1 donated, Denny's and No Kid Hungry will provide 10 healthy meals to a child in need. Not only does the organization provide meals, but they give assistance with meal planning and budgeting for families. Specifically in California, 1 in 4 children struggle with hunger... that's 25% of children. That is not okay. However, thanks to No Kid Hungry and 18 of its partners in CA, the goal is to satisfy and fill the tummies of our state's children. Our kids' school district offers free and reduced lunch for eligible families, and free breakfast for all children. Giving kids the nutrients and energy needed to function for the day is important and benefits them, but also their classmates and teachers. It's hard to focus when you're hungry (or like my kids - hangry), so I can't even imagine a child not having the basic needs of food fulfilled just to get through a school day. If you're not able to visit your local Denny's in September to donate, you can visit dennysnokidhungry.com and if you'd like to be part of the yearlong movement, Denny's will be donating $1 for every hashtag #ShareYourSlam on Twitter and Instagram. Get your kids involved, too! We participated last year as well, and my boys were eager to help make sure kids were not going hungry. You can read that here. Growing up, I never knew there was a difference between my winter body and summer body, mainly because I am not the type of person that jumps at the chance to lay on the beach, or go for a hike, or strip down to barely there and get into water, either. Mind you, I enjoy looking at the beach or admiring the forest - in pictures. I used to love being in the water when I was younger, and even swimming IN the ocean, especially Hawai'i. Until - FISH. Once I was old enough to realize they are IN THERE WITH ME - Nope. No lakes, no oceans, sure as hell no rivers and whatever is growing in there can stay in there. I resolved to only eat fish, they are not my friends - they are in fact food (sorry Nemo, but Bruce was wrong, LOL). In Northern California, we have long summers. So, even getting a late start on priming our bodies to enjoy the heat of the sun, wearing the allowable allocation of the most minimal amounts of clothing, tends to last longer that other regions of the nation. Granted, not everyone follows the same allocation of clothing to the body, but hey, do you. It's mid-July, but believe me summer is still going strong till October. I'm getting a later start, but better late than never, right? The last few weeks I've been hitting the ground running, in hopes to get my booty in shape for the summer, but with a reasonable goal to reach by my 35th birthday in November. I lovingly call it "Fly by 35." Now, I am all about loving one's self, so for those of you thinking, "girl you're already fly, love yourself," THANK YOU. I know. AND I am going to continue to love myself by making sure I am still running around by ages 50 and 60 because I have a lot to do with my life, like hopefully chase after my grandkids and great-grandkids. You know I want to be able to run down Main Street U.S.A. with each of them, for their first trip. I'm just early-prepping my aging body to withstand the future adventures. That's how I see it anyway. Then I began to think about it, and I realized that I don't want a summer bod, I want a lifetime bod. I've said it in previous posts, it's easier said than done. My weight fluctuates and my life circumstances change so I put workouts on the back burner, or even at times if food money was slim, I eat the crap to give the good stuff to the kids, or I just don't eat at all. It's a sacrifice as a parent, right? But that's not healthy either and I plan on being around for a while, so I decided that I needed to get in gear. I'm sharing my work-in-progress plan of staying on track with a lifetime bod. I'm not getting any younger, and L O V E countdowns, so my first goal is to see how I can stay on track up to my 35th birthday. Being allergic to a lot of things means my food intake is already limited. However, I am not allergic to chocolate (thankfully) but that also means that I have to limit what I'm not allergic to (chocolate) in order to balance my gut with my muscles. Regardless, I have to eat. When you're working out, expending energy, you need to intake energy in the form of foods and supplements. For work and home I switch up between morning protein shakes, fruits and raw veggies and I usually will eat leftovers from dinner that week. I haven't gotten into the meal prep craze so I take baby steps. One meal at a time, literally. When it's time to head out the door for a family meal, there are a few spots that I can count on to customize meals that fit my lifestyle and allergies. Aside from Disneyland, one of my favorite places to grab a bite (at any hour of the day), is Denny's. Breakfast, Lunch, or Dinner, I know that I can jump in a booth and enjoy a meal that satisfies my tummy and keeps me under calories. Even if you don't have allergies to deal with, maybe you're just monitoring your caloric intake or looking for healthier options, Denny's Fit Fare Menu is a perfect place to start. There are four categories for Fit Fare: Lean, Light, Protein and Fiber. They offer breakfast options like The Fit Slam (Lean, Light & Protein) is egg whites scrambled with spinach and grape tomatoes, bacon and an English Muffin; Banana Pecan Pancake Breakfast (Lean and Fiber) which sounds amazing - glazed pecans cooked into the wheat pancakes, fresh banana slices, egg whites and two strips of turkey bacon; and finally the Fit Fare Veggie Skillet (Light & Protein) - who says you can't have veggies for breakfast?! BONUS: For the gluten free customer, they offer gluten free English muffins! Throw the scrambled eggs, into the muffin and layer the bacon (hold the grape tomatoes, or get them on the side), and you have an awesome breakfast sandwich. You can even add a slice of cheese just to make sure it all stays in there together! I love cheese, so regardless of what kind of body I have cheese stays. Dinner time is always a fun time because typically I have the whole family with me, so I tend to either share a meal with the hubby, or just have something light. I don’t like to eat a ton in the evenings, especially restaurant food, it’s heavy on my gut. I can definitely see myself eating off the Dinner options, because FISH. Remember my love for fish - on my plate? Denny’s has two delicious options of seafood - Tilapia Ranchero and a new dish, Alaska Salmon. Want red meat? Then the new Sirloin Steak is your best option. When I’m not eating at Disneyland, Denny’s or trying out some cool new restaurant (I wish I did this one more), I’ll be toting my work lunch full of whatever delicious cuisine that my hubby and or kids prepared the night before! Or, I’ll be eating a gluten free cupcake. LOL. Eating right is only a portion of getting that lifetime bod. Movement is extremely important. I’ve realized after transitioning from retail to an office environment, sitting at my desk 8+ hours of the day works against my goals of maintaining a hot mama bod. I’m excited to say that I’ve been consistent in exercising either through walking, running, and/or my Nike Training Club workout app the last few weeks. On a good day, I do "two-a-days" which makes me feel super accomplished. I’ve shared my excitement over the app in a previous post, and I swear it just keeps getting better! With one of the most recent updates, I am able to schedule my workout plan and time frame. This app also works in sync with the Nike+ Running app. I decided to create a workout plan for the month of July, just to test the waters. I’ve had some times that I had to edit my plan, because I didn’t have time, or was too sore, and the app allows that freedom to switch and add workouts. I’m honestly having the hardest time with resting. My brain goes a billion miles per hour, there is ALWAYS something that needs to be done. Even if I skip a workout I am not resting, I’m doing something else. It’s important to allow your body to recover, realign and rest. Some of the ways that I’ve found to just relax my mind is by playing a game on my iPhone, or listening to an audio book. My current rest obsession is Disney's Emoji Blitz. :) It's a cute little game and you play to earn Disney Emojis for your keyboard. H E L L O - Disney Emojis. Having conversations with your crew are more fun with Disney magic. In case you want to try it out, my awesome friend Mindy wrote all about it over on her blog This FairyTale Life. If you haven't downloaded the game yet, you should. It's adorable and quite therapeutic! When you are consistently working out, make sure you are taking the proper time to let your body recover, especially if you are really starting new or have been stagnant for a long time. You will feel it, maybe not immediately, but usually the next day or two. Go hard or go home, yes, but don’t hurt yourself! All in all, I’m learning to mindful of my body and my spirit. On days that I just don’t want to workout or feel like I need to get that entire pint of Ben & Jerry’s in my mouth, I have to remind myself that I only get one body, so I need to love and care for it on a daily basis, always look to maintaining it for future use. This might look different for everyone, we all are unique. There's no right size or shape. We should work on being fulfilled, happy and whole inside and out. I want to be around for a long time. I know that my hubby and kids want that, too. There’s a lot that I haven’t experienced in life, but I’m hopeful that these eyes will be able to see things, my feet will be able to take me to far off places and that my hands will be able to create magic for a long time. Happy and healthy. That's my goal. If you're anything like me, dinner time can be hit or miss. With the hustle and bustle of working full time and coming home and assuming the "homework dance," while attempting to cook dinner with your spouse, whilst having a conversation, it gets pretty overwhelming. Sometimes, it's nice to just say to cooking, "not today," and plan for a night out. Whether we sit together at our own dinner table, or plan a special time out to eat together, there is something special about sharing a meal with your family. At the end of a long day, even if I do spend time in the kitchen, sitting down with my family brings comfort, peace and I love the interactions that ensue. This past week I began a new year as part of Denny's Ambassador Council, so it was a special treat to take the kids out (on a school night at that! ), and share a family meal. My kids & I love our local Denny's in Lodi (I-5 and Hwy 12); the staff is always very attentive, they take great care of us, and the experience is always wonderful. I know that I've shared before that Kids Eat Free on Tuesday nights, and with a large family, we like to take advantage of the savings! We specifically went to Denny's to try their newest menu "Red, White and Bacon!" Do you love bacon? Because my family LOOOOVES bacon (I won't lie, I'm eating a gluten free bacon breakfast sandwich as I type). My kids freaked out when I told them the menu was all about bacon. They were immediately sold and the countdown to our Tuesday night excursion began. For all of my bacon-loving movie fans, Denny's "Red, White and Bacon" menu is a partnership with Twentieth Century Fox and their new film, Independence Day: Resurgence. Our kids are usually little angels when we go out. All of a sudden they remember their Ps and Qs, they are cordial with each other, and they share food! I often think we should go out more often for that alone! Unfortunately, the pocket book doesn't always agree, so we get out when we can, and make it memorable with each experience. If your kids can eat off the kids menu, let them. We encourage it, especially when we are looking to save a bit of money and honestly they get enough food, even as little tweens. Now, we do have a couple that can eat off the adult menu, so then we add an extra side (usually 99¢) from the kids' menu. Selecting their food is half the fun, as the kids' menu changes just like the adult menu. Our kids still love to color and do the activities in the menu. I seriously hope they always keep their love for creating and handwriting, along with their childlike spirits! They are so fun! The kid's menu doesn't have anything "new" but the activities, and you CAN substitute the new honey jalapeño bacon for regular bacon and it is delicious! I think my favorite times when we eat out include the conversation. The kids are always entertaining, and it is sweet to see how they are growing up into little adults. We will never get these moments back. Some days are absolutely trying as a parent, but nothing brings a smile to your face more than a stranger encouraging you and telling you how wonderful it is to see a large family enjoying meal OUTSIDE the home. I think it's rare to see large families out and about, let alone confined in a restaurant. There was a time when we didn't really go out because being outnumbered by toddlers and little ones isn't always fun and games (for them it is, though). Ha. But they are growing up, and have almost mastered their inside voices that getting out is good for ALL of us, especially on those nights where my "not today" attitude is showing. Food brings us together, and it's been blessing to have more opportunities to get out and dine together as a family. So, thank you Denny's! Red, White & Blue Slam® - It's back! In honor of "Independence Day: Resurgence" this classic entree includes two fluffy blueberry buttermilk pancakes topped with strawberries, cream cheese icing, and whipped cream. Of course, a slam isn't complete without two eggs cooked to order, hash browns, and your choice of two bacon strips or sausage links. Honey Jalapeño Bacon Slam® - Everything that the Slam is known for – two eggs cooked to order, two buttermilk pancakes, hash browns, and thick-cut honey jalapeño bacon. Triple Bacon Sampler - SIX strips of bacon!! Two strips each of honey jalapeño bacon, turkey bacon, and hickory smoked bacon, hash browns, two eggs cooked to order, and your choice of bread (don't forget they have gluten free). Honey Jalapeño Bacon Sriracha Burger - This is a Sriracha seasoned, hand pressed 100% beef patty topped with cheddar cheese, two strips of honey jalapeño bacon and creamy Sriracha sauce, served on Denny's new brioche bun with a side of French fries. Loaded Bacon, Steak & Potato Skillet - note, this does not include honey jalapeno bacon, but it can be substituted! Bacon Cheddar Tots - House-made shredded potatoes, bacon and cheddar cheese, served with sour cream for dipping! I bet this would actually taste good with ketchup. Or ranch. Or both. Just saying. Maple Bacon Sundae - say WHAT?! I'll have to go to Denny's again, but on an empty stomach, because honestly by the time we got to dessert, I couldn't look at anymore bacon. :) It is on our "try next" list. This is exactly what it sounds like. Premium vanilla ice cream, maple syrup and crispy bacon. For a limited time, Denny's and Twentieth Century Fox are inviting you to participate in a fun sweepstakes, with the grand prize being whisked away to the red carpet for the Hollywood premier of Independence Day: Resurgence! You can enter by posting a photo of a person that you'd want fighting alongside of you, should we ever encounter an alien invasion! Use the hashtag #IDRSweepstakes on Twitter and Instagram and be entered to win an all-inclusive trip to the Hollywood premier! Well, it’s officially the Christmas season. The year has seemingly flown by and with Thanksgiving now on the back burner, people are okay with mentioning Christmas carols and seeing dancing lights amongst their neighbors homes. I’m okay with Christmas any and every day. If you know me personally, you know that I love all the Christmas things. To be honest, I started listening to Christmas music the day after Christmas last year off and on, but the consistency picked up probably around July. One of my favorite songs is the holiday version of "it's a small world." You must also know that I love all Disney Christmas, too. Some of my favorite pastimes of the holiday season is going to Disneyland, or viewing Christmas movies with my family, while drinking my homemade peppermint mocha. I also love Christmas shopping and holiday flavored/scented everything - from candles to cupcakes. So, naturally, it’s no surprise then if I tell you how excited I am for Denny’s Tastes of the Holidays menu! Even though I cannot eat most of it, just knowing that my family can enjoy my serious love for Christmas and I can live vicariously through them, makes me happy. This holiday season, Denny’s is unwrapping three new festive dishes, a fun Rudolph Pancake Breakfast that was inspired by the classic and famous little red-nosed reindeer himself, which includes two pancakes with turkey-bacon antlers, whipped cream, chocolate eyes and nose, with sides of eggs and hash browns; a fluffy Pumpkin Pecan Pie Pancake Breakfast that will treat your taste buds with pumpkin pancakes decked out with pecans and pecan pie sauce, served with eggs, hash browns and either bacon or sausage; and a sizzling Holiday Harvest Skillet served up with a blend of gouda-apple chicken sausage on flavorful red-skinned potatoes, sautéed mushrooms, grape tomatoes, and fire-roasted bell peppers and onions. To top that sizzle off, there’s an Italian cheese blend and your choice of two eggs. Just writing this all out is making me drool for breakfast! In addition to the new flavors, the returning dishes include the Build Your Own Holiday Slam® returns, where you can customize your breakfast and include pumpkin pancakes and gouda-apple chicken sausage, and the traditional Holiday Turkey & Dressing Dinner, complete with sliced turkey breast, stuffing, gravy and cranberry sauce - plus two sides of dinner bread! With the hustle and bustle of the holidays, I love to get the kids a little midday treat, and since Denny’s offers take out, one of the things that we will take advantage of this season is ordering the Santa’s Milk & Cookie Shake. While I am secretly crying inside because it is chock-full of sugar cookies, inevitably meaning I cannot enjoy this due to my food allergy, I know that my kids will love it. It looks so cute and festive! The shake is vanilla flavored with a blend of sugar cookies topped with whip cream and sugar cookie crumbles. I might have to make my own gluten free version at home and perhaps add a dash of peppermint or candy canes! One of the little holiday treats that your kids will enjoy is the new menu! It’s all about the holiday, and features Rudolph and friends. You will also see the new Rudolph the Red Nosed Reindeer kid’s cup, which would be oh-so-cute to add to our cup collection and the kids can enjoy homemade peppermint shakes or drink their favorite cold beverage. I’m truly grateful for my time with Denny’s this year, it has given us an opportunity to get the kids out of the house for special meals, and have new experiences in dining. We all tried new things, and found new favorites. Our local Denny’s was always warm and inviting, and they took really good care of us each visit. Remember, kids eat free on Tuesdays, so make it a family night! This holiday conversation was sponsored by Denny's; all opinions and magical thoughts are 100% mine. When you think of the hustle and bustle of everyday life, it's always nice to have a night out with the family, especially when you know that you won't be spending a ton of money! I made a plan to budget some money for a family dinner night at Denny's, with a goal of spending less than $25 before the tip, for all of seven us. Sounds impossible, doesn't it? But I'm happy to report that not only was it possible, three of us even ended up eating off the regular menu, not the $2 $4 $6 $8 Value Menu! Every family is different and you must take into consideration any food allergies, or picky eaters. But once you get that squared away, it's pretty easy! Here are four easy tips on making your dollar stretch when you want to eat out at Denny's. 1. Find out when your local Denny's has "Kids Eat Free" night. Our Denny's "Kids Eat Free" night is on Tuesday nights from 4 pm - 10 pm. The requirement for kids (13 and under) eating free is that one (1) adult purchases an entree $4 or more. Their meal does not include drinks. And the adult entree order can be from of the $2 $4 $6 $8 Value Menu. You should also know that one adult entree entitles ALL of the children in your party to eat for free; this is the real deal, not a one-for-one special that many other places have. Obviously, since our kids outnumber us by 3, it's really nice and budget-friendly. 2. Plan your meal ahead of time with the kids. Because I was challenging my wallet, I wanted to make sure there were no hiccups or "add ons" when ordering. This means, our kids didn't order drinks, just had water. I know, terrible, right? They're used to it because we typically don't drink soda or juice at home. Every once in a while they'll get a Shirley Temple or hot cocoa when we eat out, but that is not often. They also understood that they couldn't add a million extra sides to their meal because each one costs extra. Instead of each of them tacking on french fries, we just ordered one big side order for $2 and they shared it. I should have clarified with our server if their extra sides were covered, but forgot to ask. Having your kids be part of the challenge is also fun because they try to figure out how much they can eat, or order within that monetary amount. You help them become decision makers and understand the value of money and what it can or can't buy. Luckily, for us, we ate when they got free meals, so ultimately it didn't matter as long as they ate from the kids' menu. For the kids that don't get enough in their tummies off the kids' menu, you can order from the $2 $4 $6 $8 value menu. My eldest (14) ordered the $6 Eggs in a Basket and she had so much food, she ended up bringing her hash browns home. When we realized the kids would eat for free, my husband and I deviated from ordering from the value menu, mine for allergy reasons; him, because he really wanted the Super Bird ($9.69) sandwich, haha. You should also note that when you order from the value menu there are no substitutions, not even for allergy reasons. I think that is something they should consider in the future, considering the price of the gluten-free english muffin is the same price as the side of toast slices they'd use for the sandwich. In the end it didn't even matter because they were out of stock on the bread (even after calling ahead of time to confirm they had some), so I just ate chicken sausage, egg whites, and hash browns. Here's a glimpse at the menu, there is a lot that you can choose from and even if your entire family at from the value menu you can still save! Denny's often does advertising through coupons in the paper or daily mail. Additionally, make sure to sign up at Dennys.com for rewards and you get a 20% off coupon. Since we recently participated in the Denny's No Kid Hungry initiative, we had a $5 off $20 coupon which came in handy for this trip. Okay, so our grand total (not including the tip) was $24.04! That's pretty awesome for feeding all seven of us! This is a sponsored conversation through my partnership with Denny's. All opinions shared are mine and hopefully added some magic to your day! I'm doing a giveaway with Denny's starting now until October 12, 2015! In case you missed, it, I am partnering with Denny's and No Kid Hungry in an effort to end child hunger in America. You can catch up here and here. The time is coming to a close, and in an effort to spread as much awareness as possible, we are doing a giveaway for the last week of our fundraising! It's easy to enter, just dine at Denny's and if you choose to donate $3, you are qualified to enter! When you donate, you also get coupons for future visits! Did you already donate and visit Denny's during this campaign? Upload your pics and tag away! It counts!! Head to your local Denny's and donate $3+ to No Kid Hungry, snap a pic of your visit, follow & then tag me on Instagram or Twitter (@camilledashana), use the hashtag #DennysMagic, and be entered to win* a $20 Denny's gift card & No Kid Hungry t-shirt! *Winner must be 18 years or older. There is no limit to entries; winner will be chosen at random through Random.org. This giveaway is sponsored by Denny's. Every once in a while I crave some bubbly. I'm not typically a soda drinker, but I love the sparkles! I grew up drinking Italian sodas, so I thought I'd try making something to satisfy the craving with less sugar and heaviness. I wanted to figure out a way to have the bubble, a hint of sweet, and not a fruity flavor. Well, believe me when I say that I have plenty. There were five Star Wars™ flavors, and one was Italian Sweet Crème! It also happened to be Boba Fett bottle design, hence the name. Add your ice, club soda, creamer (I liked it with 1 tbsp, my kids preferred it with 2), then syrup. Stir it up and drop in a fun straw. It's always more fun with a straw. And there you have it! Easy, peasy! 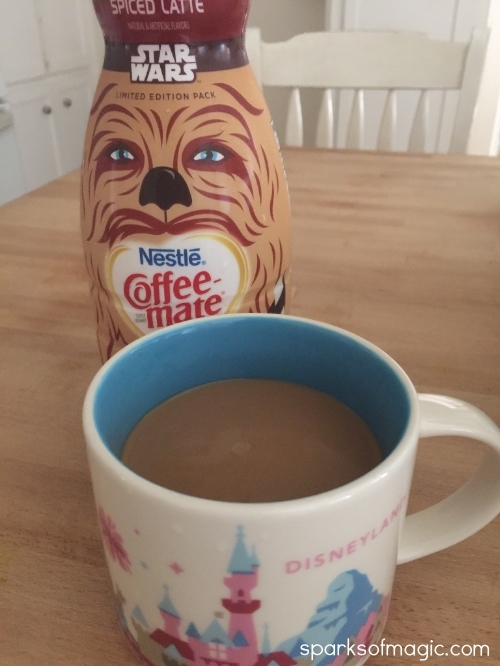 This would have been an awesome drink to serve at my son's Star Wars™ Episode X party, but we can have it for our Force Awakens celebration instead! Be creative and try out any creamer flavor or syrup combo. I was happy with the slight hint of vanilla, and more bubble. Too bad the Force can't whip me up another! Are you brave enough to try out the Boba Soda? It's the last week of school before my kids will have their first quarter, two-week break. During this final week, my boys have 1/2 day sessions all week. In an effort to spice things up, and keep my sanity, I thought it would be a fun surprise to take them out on a little dessert date before we started homework. I met with both of their teachers in the morning for parent conferences, and I'm happy to report that they are both doing well. So, I whisked them away and we went on a Mommy/Sons date to Denny's! As brand ambassador, I make it a point to visit my local Denny's and chat with them about any promotions. In this case, I was prepared to discuss Denny's joint effort with No Kid Hungry. The minute we walked into Denny's they stood in amazement at all of the campaign fliers posted, signs on the table, and walls full of people's names. What simply started out as a fun dessert date with my boys turned into much more, as I shared with them the campaign I was working on with Denny's and No Kid Hungry. They colored and ordered their Oreo blaster shakes. They also had fun testing out the Dreamworks COLOR app with the new HOME, Dinotrux, and Mr. Peabody & Sherman kids' menu. We talked a lot about food, and after all of their questions, I shared my part in the No Kids Hungry campaign. Sometimes I forget that inquiring minds want to know what I'm up to, and it was actually a proud moment for me because they understood the importance of the campaign. For our family, we've been blessed to have huge support system with family members that lend a helping hand if we ever need it. I told them that not all kids have that luxury, and as a family that is blessed to receive help when we need it, we should pay it forward and do what we can to help others in need. I broke down the donation monetary amounts for them (it was a fun little math lesson), and told them that $1 provides up to 10 meals, and $10 provided up to 100! They thought that was pretty awesome, and immediately asked if we could participate... because, "kids are hungry and it's not right for them to be if everyone just helps." My eldest son had a sad look on his face and said he wished he didn't spend all his birthday money (way back in April) because he would give $10 to donate for 100 meals. I reassured him that we can't go backwards in time, only forward. So they can be mindful and grateful for all that they get to eat, and be willing to share what they have with others. As I shared in my previous post for this initial campaign, my kids thankfully have never gone hungry for lack of food. The many times they are hungry, is usually due to a picky palate, not because they don't have anything to eat. This campaign really reminded me of the luxuries afforded to us that so many don't have. Did you know that if you dine in the restaurant and donate $3, you'll get coupons in return, well over the amount of your donation, for future dining? My boys were most excited to write their names on the wall, knowing we helped to give 30 meals to other kids today. They are both very tender hearted and simply can't imagine the thought of not being able to eat when they need it most. Kids are so active, and the lack of nutrition truly affects their moods, retaining information and is a determining factor in their behavior. This cause is so important for that reason alone. We are talking about the future of our country – the minds of our children. If you're not able to get to a Denny's location, you're always welcome to donate directly through my fundraising link; there's still time to support the cause in ending child hunger in America. I hope you'll join me and my family, Denny's and No Kid Hungry as we work to bring awareness to this nationwide issue of child hunger. This conversation was sponsored by Denny's. While I have been compensated to share my thoughts and help bring awareness to the No Kid Hungry campaign, All thoughts and opinions shared are mine. Throughout life there are times where we sit back and reflect on what we have, the privileges afforded to us, and blessings received. As I have partnered with Denny's recently, one of the organizations that they are connected to is No Kid Hungry. When I was asked to participate in this awareness campaign, I knew it would be one that I'd be proud of. The numbers don't lie. In fact it's unsettling when you realize just how many kids are going without food in America. Did you know that 1 in 5 kids will face hunger this year? Here –yes, in America. I know that we know there are poverty-stricken areas, but even the middle class is hit with these scenarios. If we get a little more detailed, here in California, 1 in 4 kids will struggle or have struggled this year. Only 53% of kids that qualify or free/reduced lunch also get school breakfast. Sadly, only 20% of kids that qualify for free/reduced lunches will have summer meals. In our local school district, all kids are able to get free breakfast, and over the summer, they did free breakfast and lunch for any child under 18. Man, that's a lot of kids without basic meals. Having a system in place like this allows for every child to get extra nutrients before putting their little minds to work. Learning and growing is dependent on nutrition, and when a person (myself included) is hungry, we know it is hard to focus and concentrate. I appreciate the many teachers and administrators that notice this and help those children in need, sometimes even out of their own pockets! I've heard countless stories of children not having enough food, and it affects their education, on top of everything else. I can't imagine the thought of my children having to miss meals due to lack of food. But that is the reality for many families. We do our best to teach our children to be grateful, and appreciative of all that they have; to learn to eat food, even if it isn't their favorite, and to not waste food that they are given. We teach our children to give, and the help others. While I am a paid member of Denny's Diner Ambassador Council, I am so proud to be part of the No Kid Hungry campaign. I would love for you to please help me and our Ambassador team as we raise funds for this important cause. Please check out my fundraising page – all proceeds will go directly to No Kid Hungry. A non-profit organization dedicated to helping to feed children across America. The campaign itself connects kids with nutritious foods, and teaches their families how to cook healthy meals. For more information on the No Kid Hungry campaign initiative visit their website. I'm grateful for each and every one of you that took the time to read, those that will donate, and if you feel inclined, please share this message! Disclaimer: I am a member of Denny's Ambassador Council, and while this post has been sponsored, all thoughts and opinions are mine. One of the downfalls of having a food allergy is that in smaller towns, usually there are less options for dining out. For our family, though, we typically don't eat out, so this doesn't affect me as much as it does for others. Thankfully, I have found ways to eat semi-healthy and remain pain free when eating out. One restaurant that has been really accommodating is our local Denny's. When I first started this ambassadorship with Denny's, I knew it would be a great opportunity to take the kids out as a family or on special dates to experience America's beloved diner. Little did I know that I'd actually have quite a bit of options myself, being allergic to gluten and attempting to have a fairly healthy eating lifestyle. One of my favorite features of Denny's healthier eating initiative is the Fit Fare menu. Typically, I order just sides instead of entrees, or I will eat something before we go out as a family or on a date. But with the array of menu items, I am happy to say that I now eat full entrees when we hit the town. I'm really looking forward to my next Denny's date because I will be ordering the Fit Slam® from the Fit Fare® menu. The Fit Slam® consists of scrambled egg whites, spinach and grape tomatoes, bacon, seasonal fruit, and English muffins. I'm extremely excited to announce that some Denny's diners do offer gluten-free English muffins and they'll pair perfectly with the Fit Slam®! We know that Denny's offers breakfast all day, which is awesome, and on days that I don't necessarily want to eat a heavy dinner, I think having the option for a light breakfast-type meal for dinner is not only versatile, but my body feels so much better after eating. Another meal I'm looking forward to trying is the Cranberry Apple Chicken Salad. << YUM>> A delicious breakfast alternative, this will be a delightful lunch or dinner date meal. I don't really make salads at home, my kids don't eat them as much as they do other veggie dishes, so I usually reserve salads for when I eat out. There are eight (8) menu items, plus an additional one for the senior population, on the Fit Fare® menu. When you add in the many ways to enjoy your own Grand Slam®, you really can't go wrong! I'm excited to be a partner with an organization that is making steps to increase a healthier eating style for those that want it. Having options is always better, and in the end it does increase consumer loyalty because I know that when I am out of town, I can count on Denny's to have food items that fit within my family's food lifestyle. Make sure to follow me on Instagram and twitter, that's where I share all of my eating fun, on-the-go! I am a member of Denny's Ambassador Council, and while this post has been sponsored and I have been compensated, all thoughts and opinions are mine. I hope you enjoy reading about my experiences with my family at Denny's!